Though I don't often get up and shoot sunrise, I sure do love it when I do. Shooting first thing in the morning is just awesome. In addition to getting great light a lot of times, I find that choosing to be creative early has a positive affect on me that carries through the whole day. I am more awake and excited, even if I have sacrificed a little sleep. Plus I get to look forward to downloading the photos later and seeing what I captured - that's always fun! 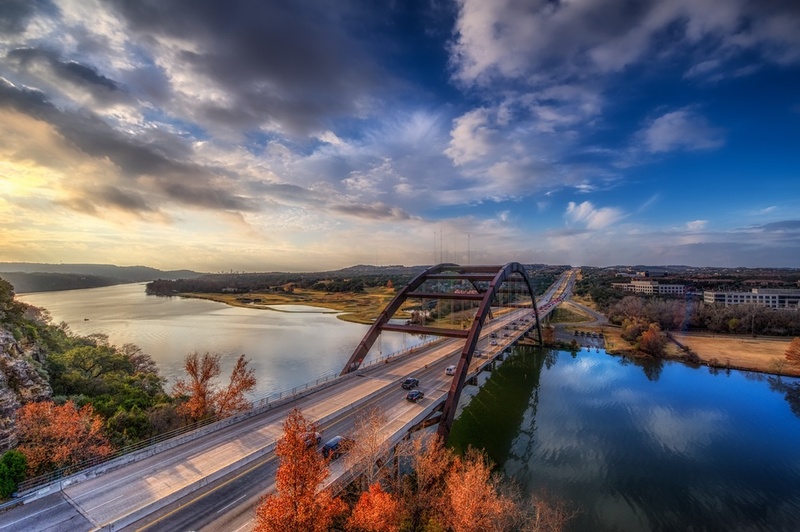 A few weeks back I got out early (but not too early) with the plan of grabbing some shots here at the Loop 360 Bridge at sunrise. The previous day had some great clouds, and the weather forecast looked like more of the same for this day, so I was hopeful that I would get something of interest in the sky. Clear blue skies are great for picnics, but terrible for photography (at least in my opinion). Though I didn't make the actual sunrise here, when I showed up it was full-on awesome and I immediately set up and started firing away in every direction. When the clouds are interesting and that rising sun is hitting them just right, you have to capitalize on it! And just for fun, here is a "behind the keyboard" view of the photo as I was processing it in Color Efex Pro. This is a 7 frame HDR, merged in Photomatix, and as you can see from the below I then added a few filters in Color Efex Pro to finish it off.